Bus tours Disneyland hotel to LAX include tour, transportation and transfer. Your luggage will be safely stored on board our touring vehicle. Our guide will pick you up at Disneyland Anaheim hotel or LAX airport terminal and start our LA city tour. During the Los Angeles bus tour you will visit famous Los Angeles sightseeing landmarks: Hollywood Blvd, Mann Chinese Theater, Kodak Theatre, Hollywood Sign, Sunset Strip, Rodeo Drive in Beverly Hills, Bel Air, World Famous Farmers’ Market LA and The Grove LA (optional time for lunch 30 min), Santa Monica Pier. Our best tour of Los Angeles will include couple of stops at various points of interest, including the Hollywood Walk of Fame and is fully guided with live sightseeing commentary. At the end of the LA sightseeing tour we will drop you off at LAX or Disneyland Anaheim hotels or at Hollywood, Beverly Hills, Santa Monica, Los Angeles hotel. Reserve your tour and transfer trip with this easy and convenient transfer from Disneyland Anaheim or hotel. Your luggage will be safely stored on board our vehicle. We can customize Disneyland hotel Los Angeles tour to suite your needs. This Hollywood to Disneyland tour is very friendly for slow walking people, elderly, families with small children and we can adjust the tour, as we go. This is a unique half day bus tour from Disneyland hotel to see the best of Los Angeles and to be transferred to your LAX flight or Disney Anaheim hotel. 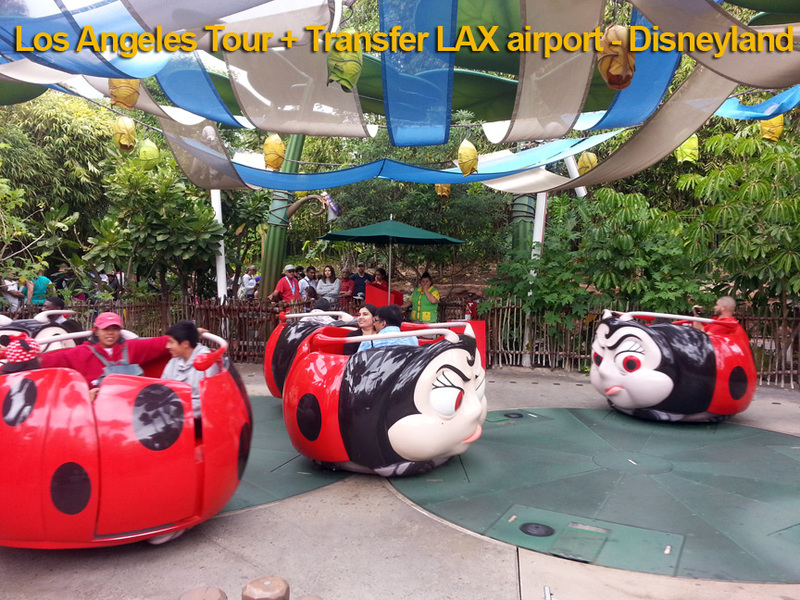 When booking bus tours from LAX airport to Disneyland, please provide the date, flight number in the Comment section. To book please drop us a quick note to info@latraveltours.com or call 1-800-761-1775, From Canada, UK, Europe 1-213-537-5770, In Australia, call (03) 9005 5907. American Riviera Private Tours reviews. We will be glad to help you with the half day LAX city tour in Los Angeles. *Drop off and pick up is available also at the Los Angeles World Cruise center in San Pedro, CA or Long Beach cruise terminal. You can prolong the tour for an additional hourly fee. Best value: you can combine shuttle Disneyland Anaheim transportation transfer service and travel tour together.